Even after having made so many trips to Michigan's Copper Country and the Keweenaw Peninsula, I still had not made it to the historic Fort Wilkins, at the northern terminus of U.S. Highway 41. I finally made a point of visiting in October of 2014. 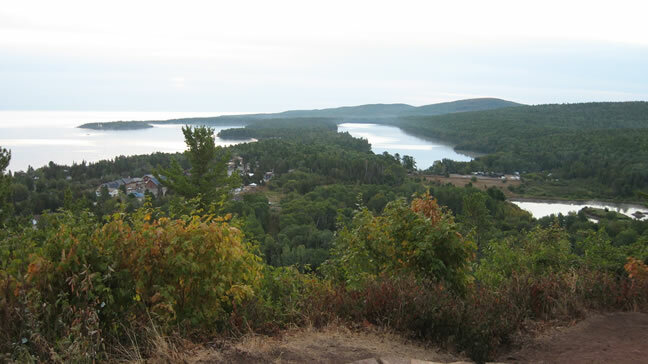 Rutabaga and I traveled along the Brockway Mountain Drive for a scenic journey to get there from Eagle Harbor, but it can be fairly said that there is not a single drive anywhere in Keweenaw County that is not scenic. Unfortunately we got here late in the day and most buildings were already closed, but we were still able to wander about the fort grounds freely. The first of the treaties separating the local tribes from their mineral-rich lands in this region was signed in 1842, and the federal government quickly had it surveyed and sold for mining. The Michigan Copper Rush began in 1843, and Fort Wilkins was built in 1844. The local U.S. land permit office was originally down in Houghton-Hancock, but according to local historian Lawrence Molloy it was relocated here to the fort when it was built, to distribute leases to arriving copper prospectors. Fort Wilkins is definitely not very heavily fortified...the term "fort" is more of a formality, really, since in truth it is more like a wilderness outpost surrounded by a small, log palisade on two sides (Lake Fanny Hooe protects the other two sides). In the 1840s northern Michigan, being an unsettled wilderness, was still part of the "Wild West." There were no roads, only Indian trails, so the only way to conduct major commerce was by sailing ship, which depended upon the few natural harbors to be found along the Keweenaw's jagged, mostly uncharted Lake Superior coast. "Fearing that the Indians of the area might be resentful of the intrusion of the prospectors and the miners," the U.S. War Department established Fort Wilkins to protect the incoming white settlers from those ghastly savages. It soon proved however that the natives were "far less dangerous than the boisterous prospectors and miners," according to the book Michigan, A History of the Wolverine State. Along the back of the Keweenaw Peninsula, the first frontier ports in the early Copper Rush were established at Ontonagon, Eagle Harbor, and Copper Harbor, and each started to get rowdy as tent cities sprang up around them with the arrivals of prospective miners. Again, the taming of northern Michigan presaged the much more romanticized American story of the Wild West, and the Michigan Copper Rush was a preface to the much better remembered California Gold Rush of 1849. In the days when Michigan copper was shipped from those three ports, it was coming from the older, first-wave mines like the Cliff Mine, Old Victoria Mine, and Norwich Mine (all of which I have already explored in depth on this website). There were also the early mines on Isle Royale, which should probably not be left out. Hunt's Guide to Michigan's Upper Peninsula describes Fort Wilkins as "way beyond the frontier of settlement," and points out that it was the northernmost garrison in the United States, flung some 600 miles from Detroit. Of the soldiers garrisoned here between 1844 and 1870, 8% died while serving in the Army (half of natural causes), and 11% deserted. I'm guessing that's because for six months out of the year, the weather here made it feel like being stationed in Siberia. Some also perhaps found it more attractive to be a prospector than a soldier. As you can see, the fort is perched right on Lake Fanny Hooe, although this minuscule outpost hardly commands a formidable strategic grip on waterborne trade; if the British Navy had somehow reappeared in Lake Superior to compete for the riches of these lands, tiny Fort Wilkins would have posed no obstacle to them (neither would have the obsolete Fort Mackinac or Fort Brady, for that matter). Fort Wayne in Detroit was the only real strategic protector of the upper Great Lakes during the 1840s Copper Rush, but it was never fully armed. Luckily there was very little chance of having to repulse naval invasions of the Great Lakes after 1865. One thing Fort Wilkins had going for its defense however was that it was located in the woods so far back from navigable waters that I don't know if any enemy naval gun from that era would have been able to reach it, even if they knew where to aim. By the same token, Fort Wilkins was equipped with no seacoast-caliber artillery—only a few field pieces. Then again, when the fort was active it is likely that all the trees in the area would have been chopped down to be used both as lumber and as fuel, and so as to eliminate the chance of a surprise attack. A casual glance at Fort Wilkins' location on a MAP makes it seem as if it were deliberately placed so as to protect it from the chance of ever being engaged in a real battle. If it were built substantially—with stone ramparts and heavy cannon—and placed out on Hayes Point where the lighthouse is, it could have plausibly protected the shipping route through Copper Harbor, but it appears to be more designed to command Lake Fanny Hooe than Copper Harbor for some reason. Which seems strange since this small lake is hardly of strategic importance, as it doesn't connect to any other major water route. Fort Wilkins was left unmanned until 1867, when some Civil War soldiers were sent here to fill out the remainder of their enlistment terms. It stayed open in that capacity until August of 1870, when it was permanently decommissioned by the Army. Most of the small-time prospectors had given up and left the Keweenaw by 1846 anyway; the larger mining companies stabilized the region, and the fort wasn't needed to "keep the peace" anymore. As I recall, there was a plan issued by Washington D.C. in the middle of the Civil War to beef up U.S. defenses along the Great Lakes by building a chain of new heavy forts and to reinforce existing ones, in case the Confederate alliance with England resulted in a British naval assault designed to cut off crucial Union supply routes. I don't recall whether Fort Wilkins was considered for reinforcement at that time, but Fort Wayne was heavily improved, and later so was Fort Brady at the Soo Locks. After the Army abandoned Fort Wilkins in 1870, the Hunt's Guide to Michigan's Upper Peninsula says it became a popular picnicking and camping spot, and the favorite destination of a certain bicycle club in the 1880s; by 1910 automobile clubs were doing similar jaunts. I imagine the buildings were kept up somewhat by the locals who used it for picnicking and camping, but it probably started to fall into ruins after the automobile brought more tourists (and vandals) here from further away. So you see, "Urbex" already existed over a century ago. Fort Wilkins became a Michigan state park in 1923, although by that time it had fallen into ruins from being mostly left to the hands of nature (and Urbexers) for the better part of 50 years. When the Works Progress Administration (WPA) began operating during the Great Depression, restoration work began on the fort's surviving buildings from 1939 to 1942. That was when the site was modernized into the park we see today—i.e., with a parking lot, water and sewage, a park store, and campsites. Even today, Fort Wilkins is sort of like the last place on Earth. It is the furthest point you can drive to in Michigan (without a 4x4). Highway US-41 ends here, and beyond it there are no communities or any sort of civilization; just solid wilderness from here to the tip of the Keweenaw Peninsula, ten miles away. There are the ruins of the old Keweenaw Rocket Range on Keweenaw Point, but again, you need a lifted vehicle to get there, or hiking boots. One of these days I will actually get out there to the rocket range, Schlatter Lake, and High Rock; I'm told it is a sublime wilderness area. Stay tuned. The Fort Wilkins site is currently managed and interpreted by a public-private partnership between the state parks and the Fort Wilkins Natural History Association, a non-profit organization that raises money to support and sponsor programs and special events at the fort. They were the second such organization to do this kind of partnership in the state of Michigan, and having started here at Fort Wilkins in 1969. Every year there is a summertime artillery muster at Fort Wilkins, usually the last weekend of July if I'm not mistaken. Lots of reenactors, and cannons going boom. Inside, crates of musket balls and kegs of powder...or are they kegs of firewater for "keeping the peace" with the Indians? Lawrence Molloy writes that the lake was named after Captain W. Albutrtis' teenaged sister-in-law, who went down to the lake one day to do some laundry and never returned. 11% is actually a fairly low desertion rate for that time period. The book "Forty Miles a Day on Beans and Hay" about the Indian Wars era (1865-1890) described desertion rates as high as 30% or more at some outposts.